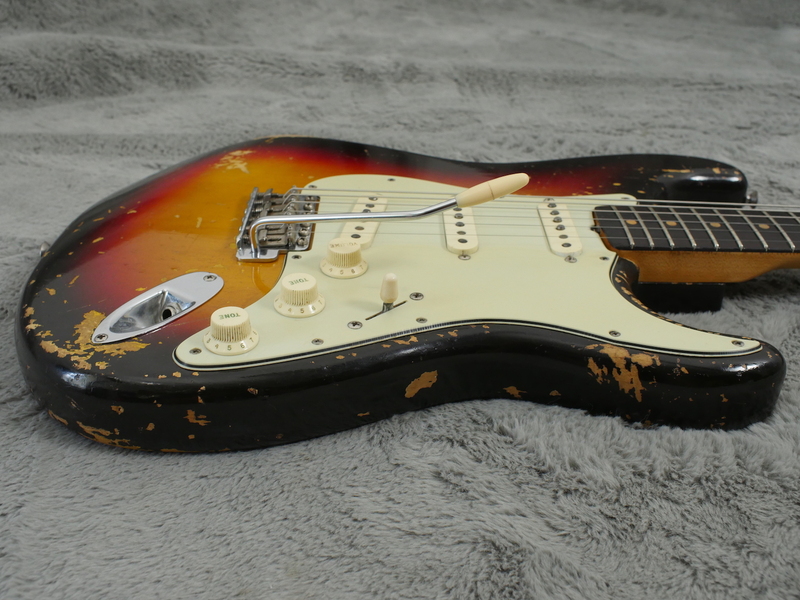 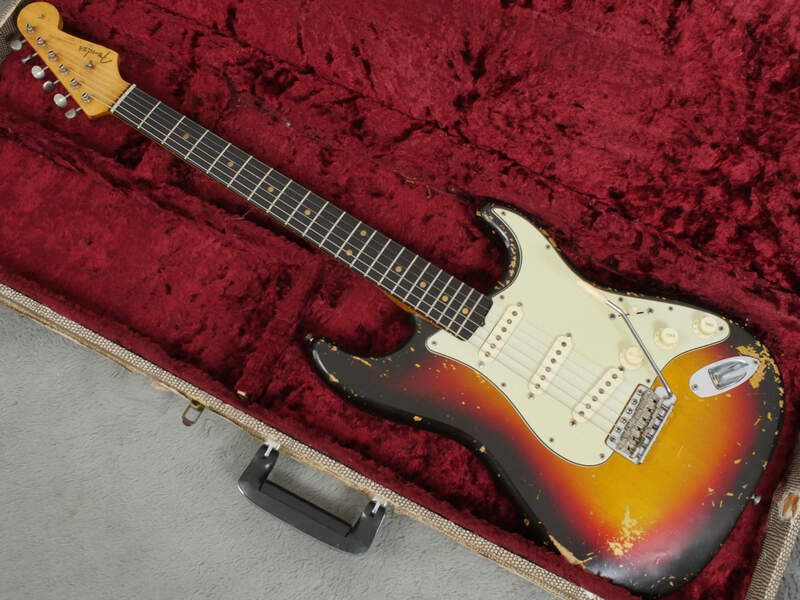 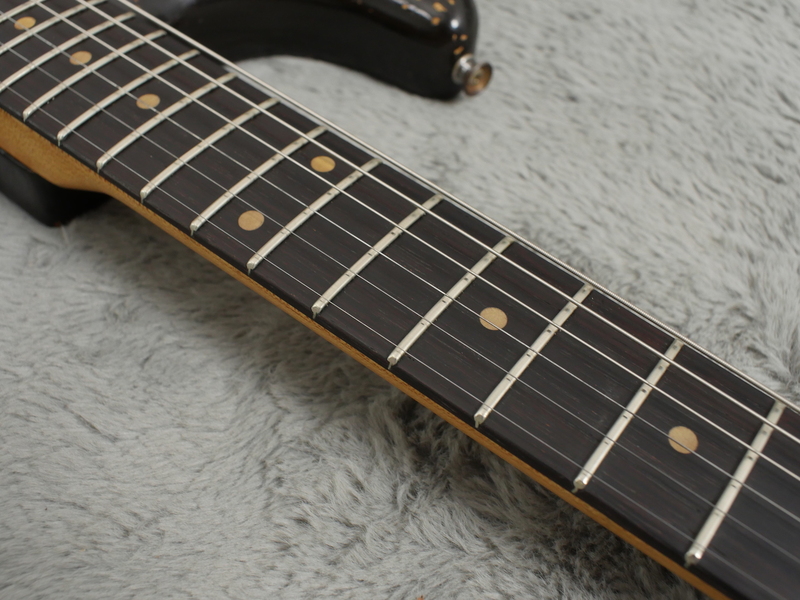 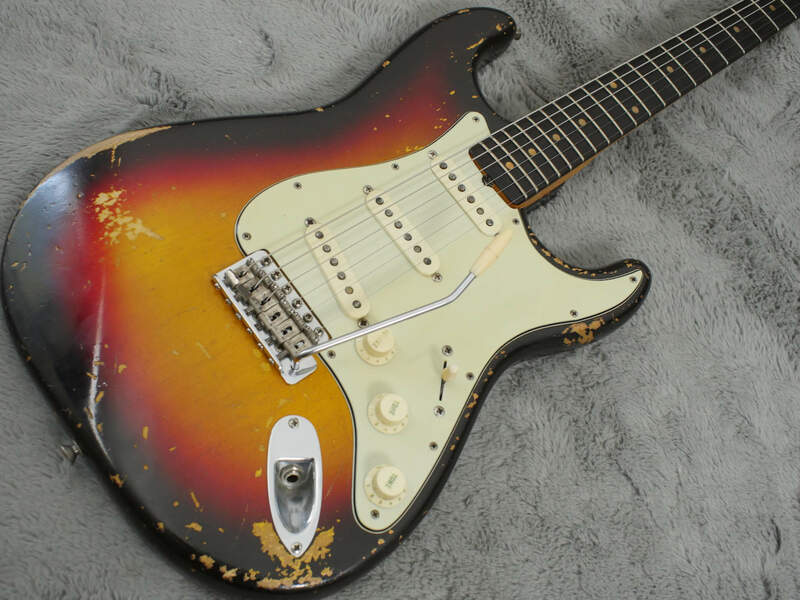 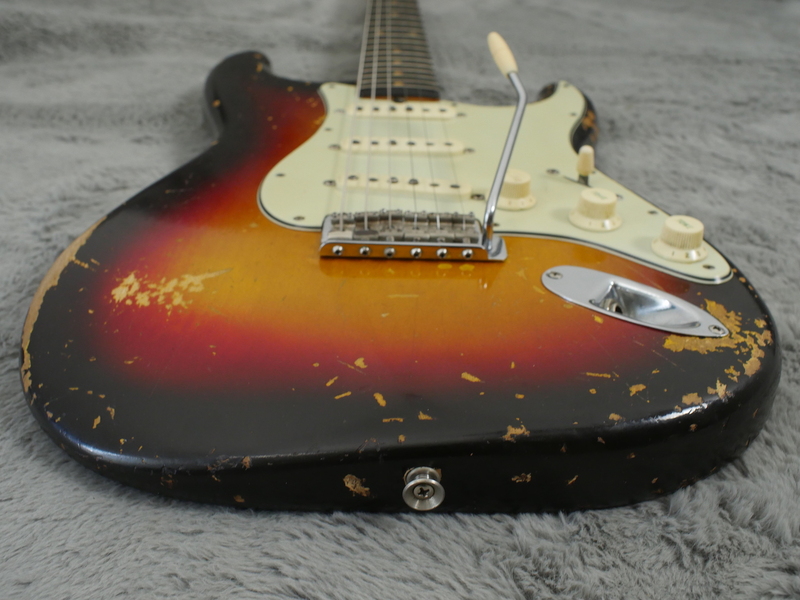 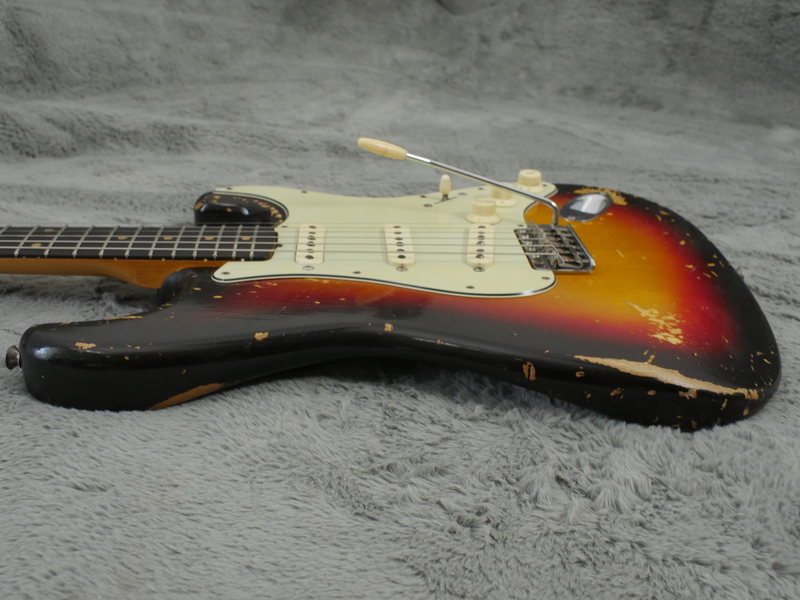 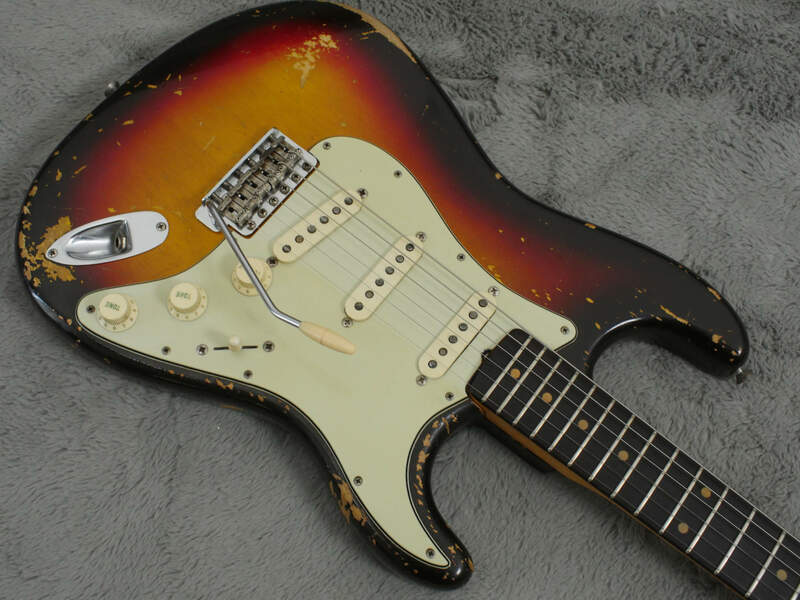 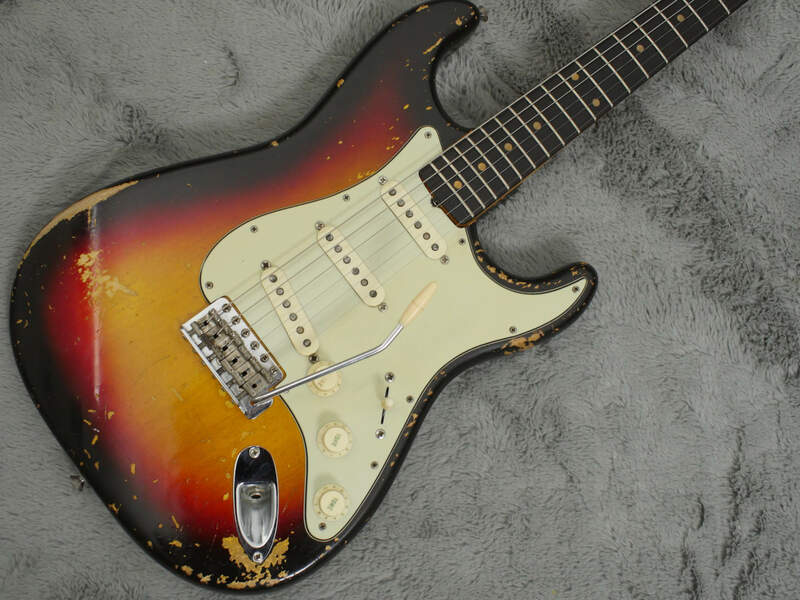 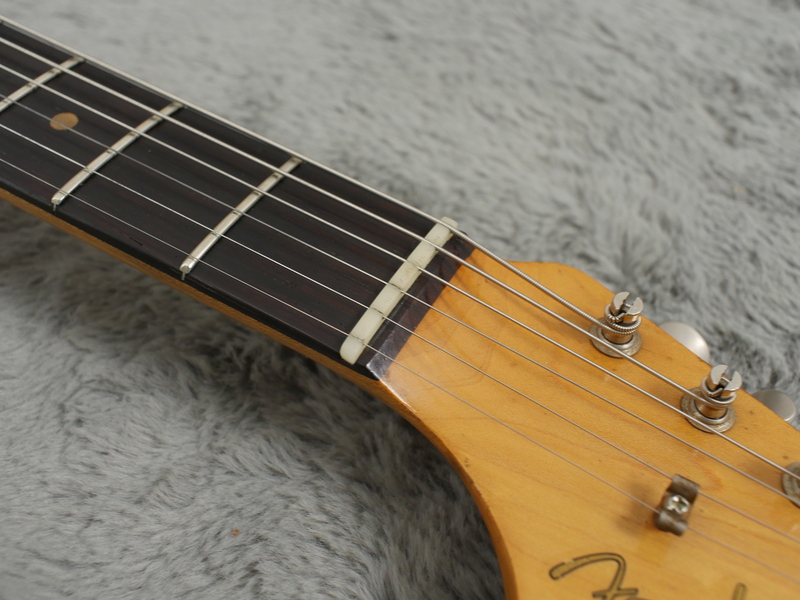 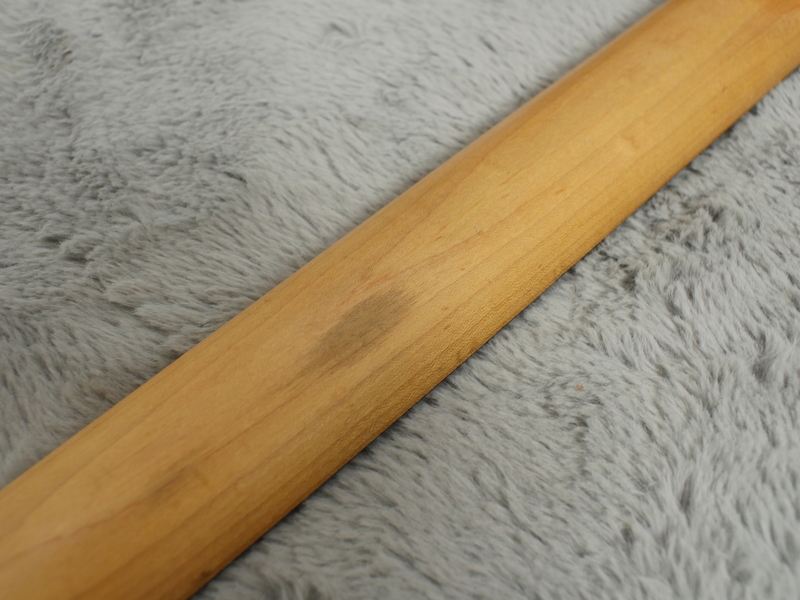 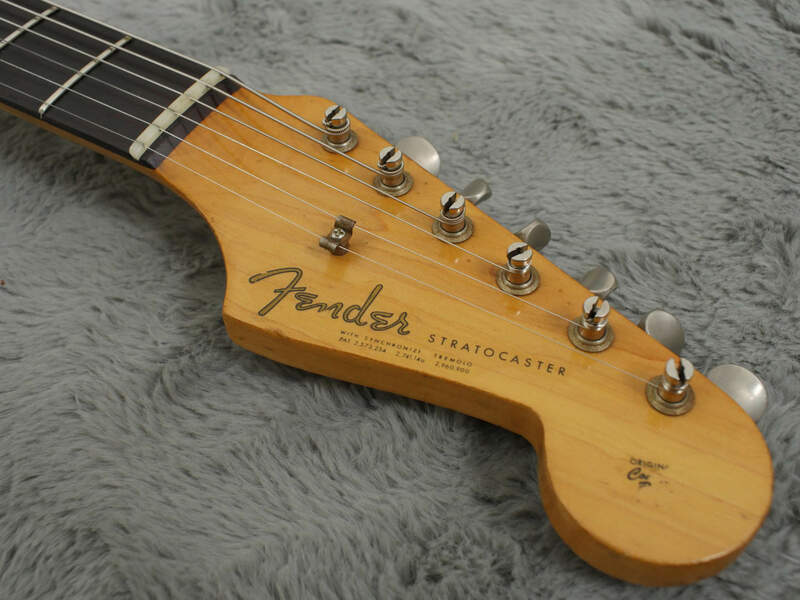 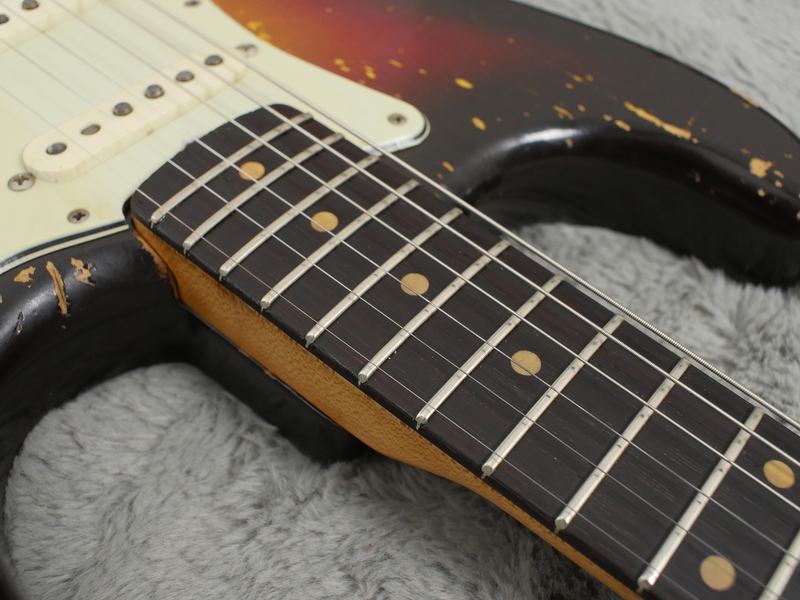 Both neck and body are dated at October 1962 and it is one of the early curved fingerboard types that in 1962, still retain a reasonable chunk of rosewood. 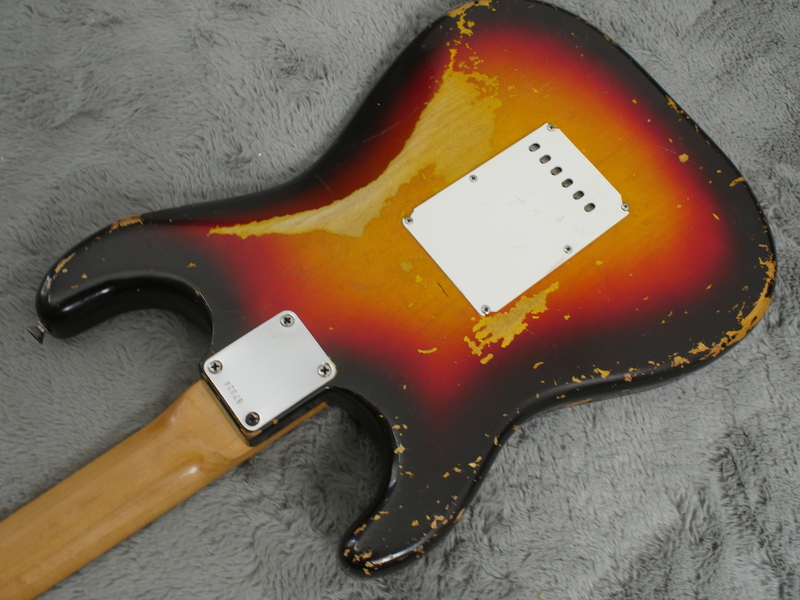 The custom contoured core of the guitar is player worn but free of any modifications with its original sunburst finish still resplendent. 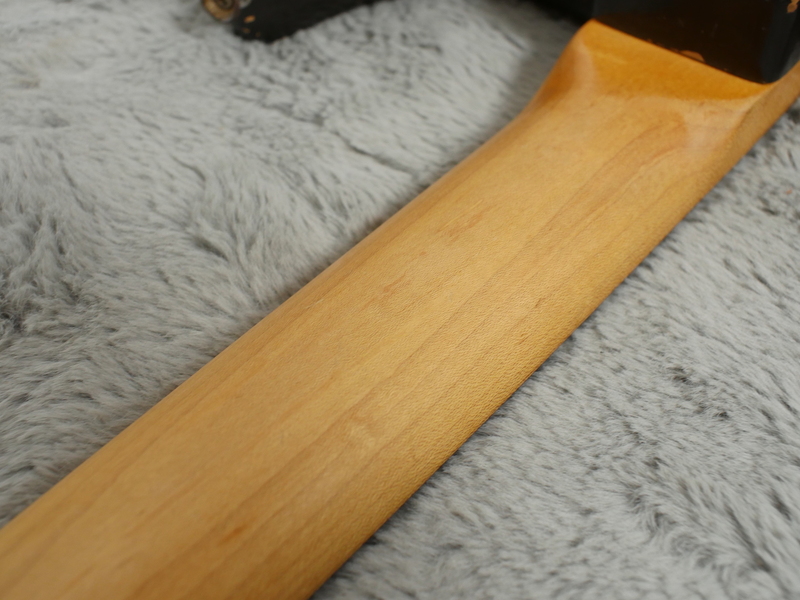 The back of the neck has been cleaned but shows no sign of over-spraying. 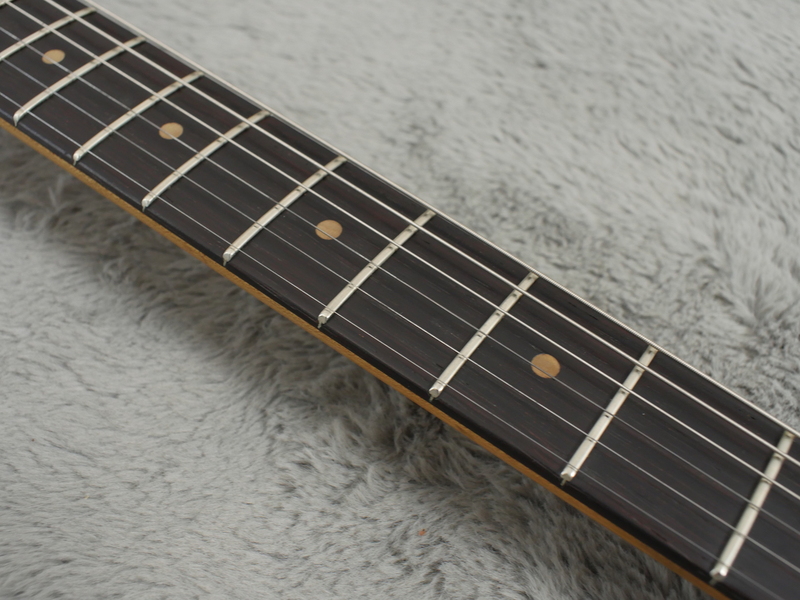 The nut and frets have been replaced but makes for a comfortable, resonant and very playable instrument. 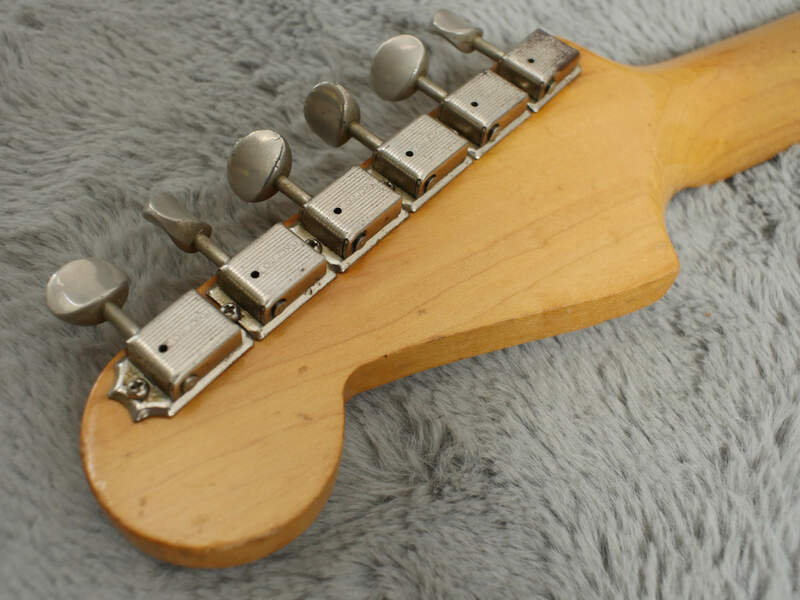 The pick guard is in fantastic condition and has remained crack free. 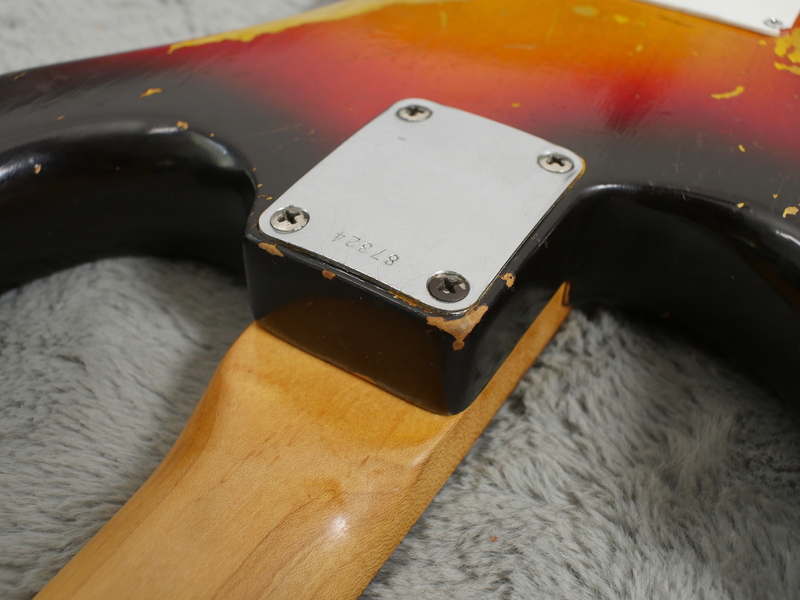 There are two places where the solder has been disturbed, one on the volume pot leading to the jack (but not on the jack side) and the switch contacts. 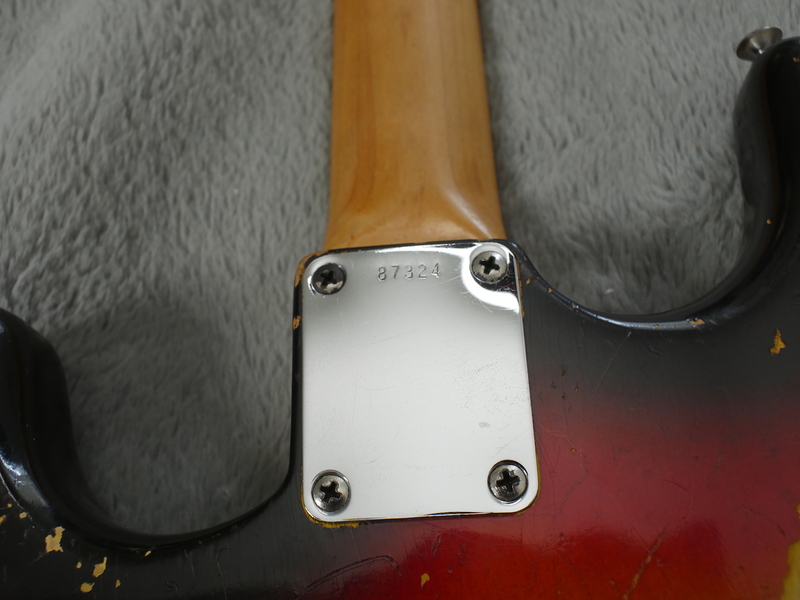 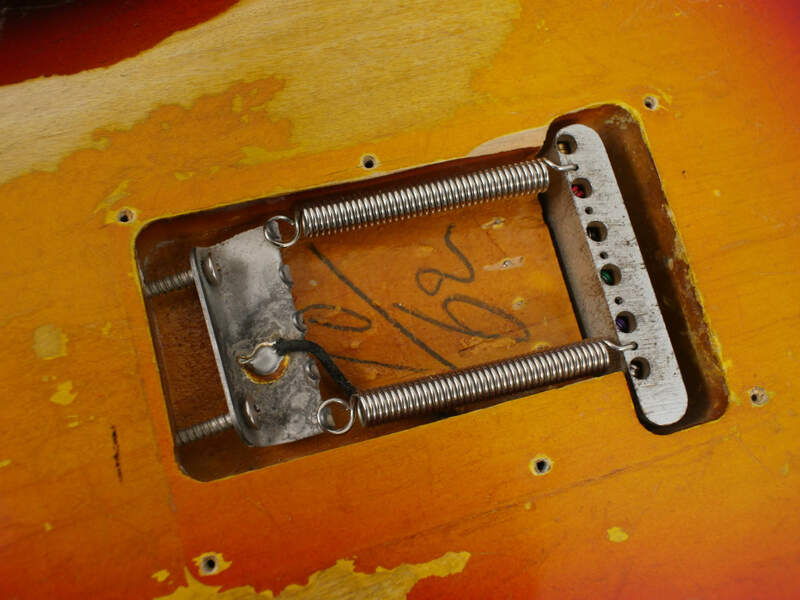 The solder on the volume pot from the pickups remains intact and undisturbed. 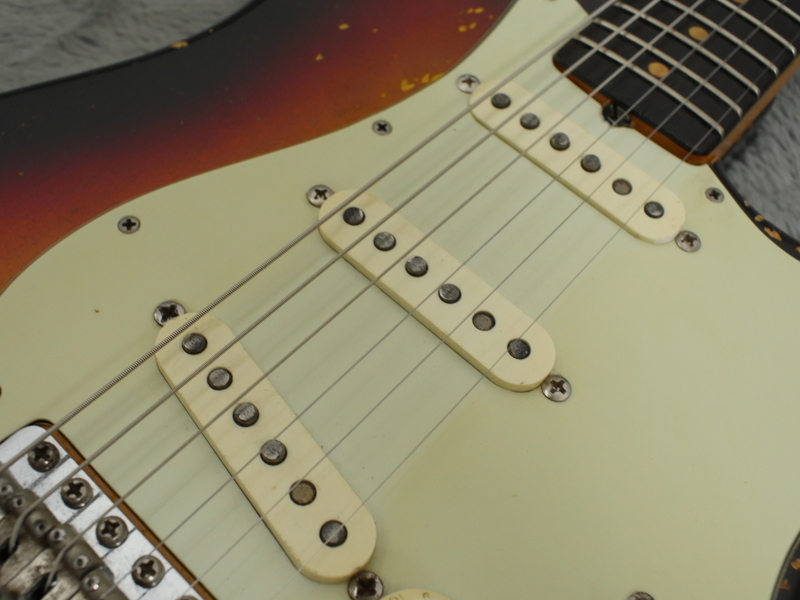 All three pickups read very healthily and sound blooming marvellous with all original windings, in fact these are some of the best we have had here, testament to the fact this guitar was only recently prised off a superb, hard working guitarist here in the UK who featured on a fair few albums and tours. 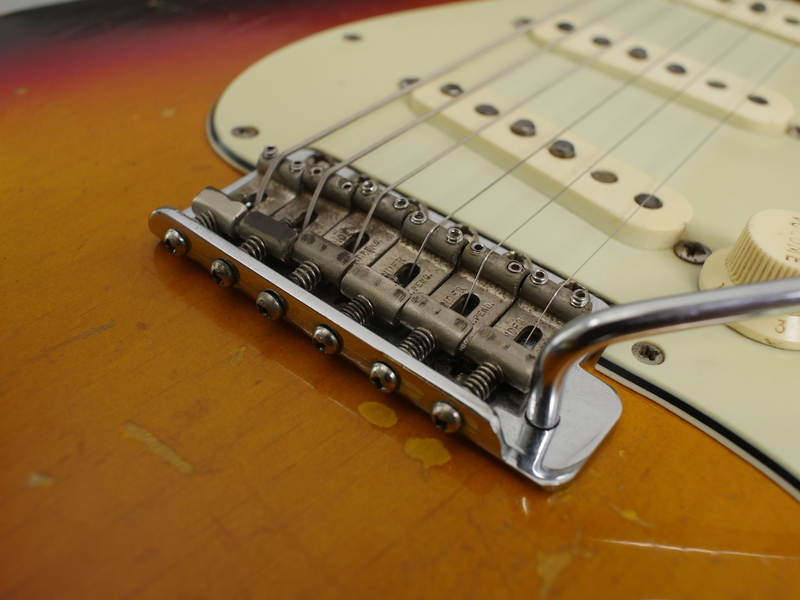 All hardware is correct with the exception of the trem arm and the hight adjustment screw for the saddles. 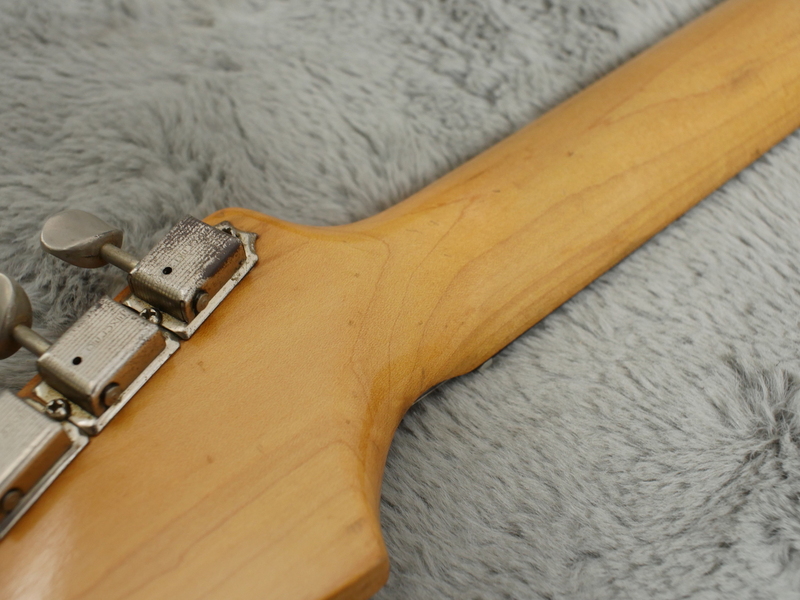 The original screws are included in a bag inside the case should you wish to refit them. 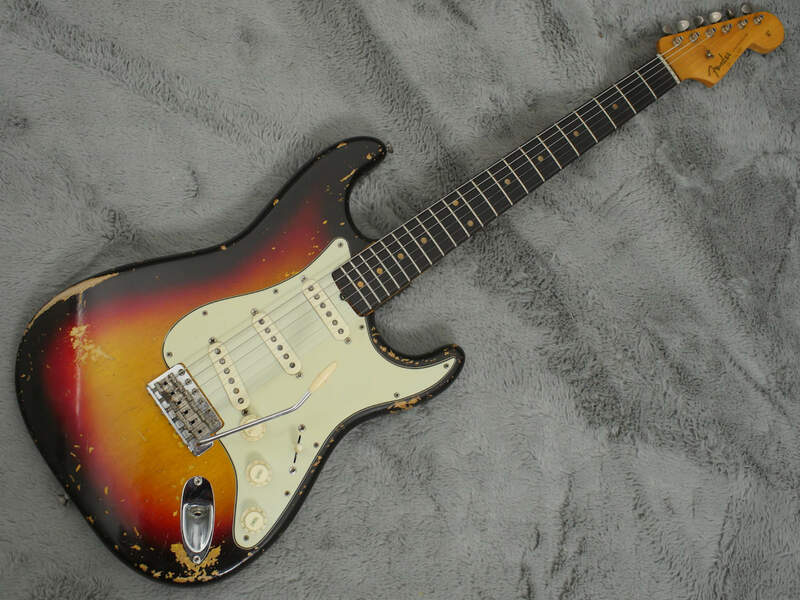 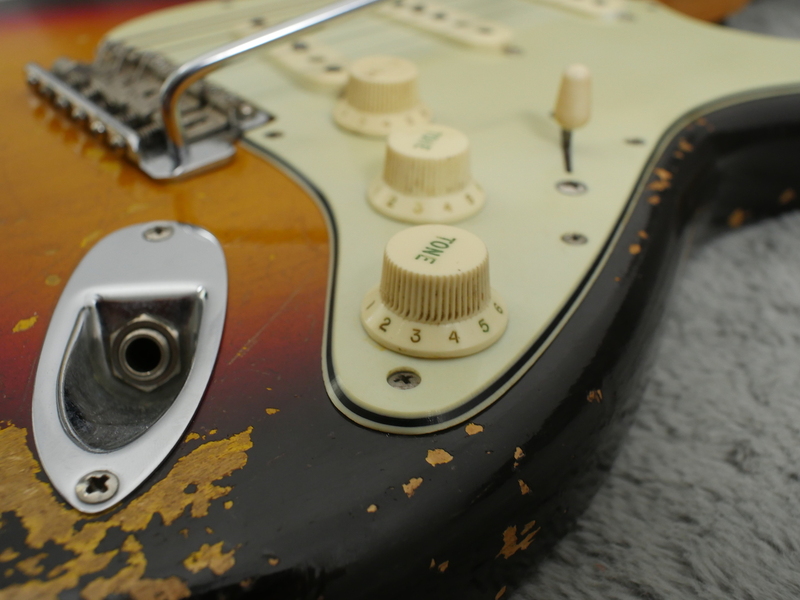 Pickguard is particular nice with absolutely no crack or repairs or tips missing. 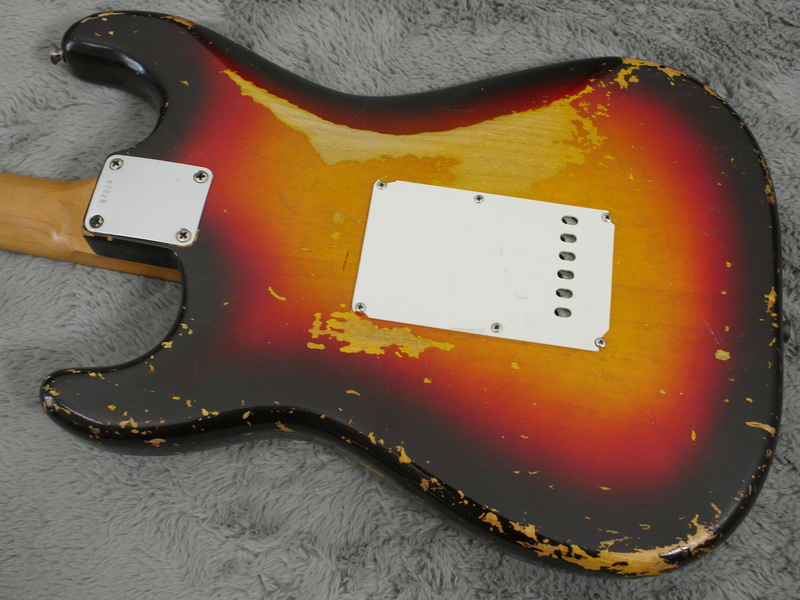 Finish is all original with no touch ups or overspray anywhere and as stated, a cool about of genuine wear. 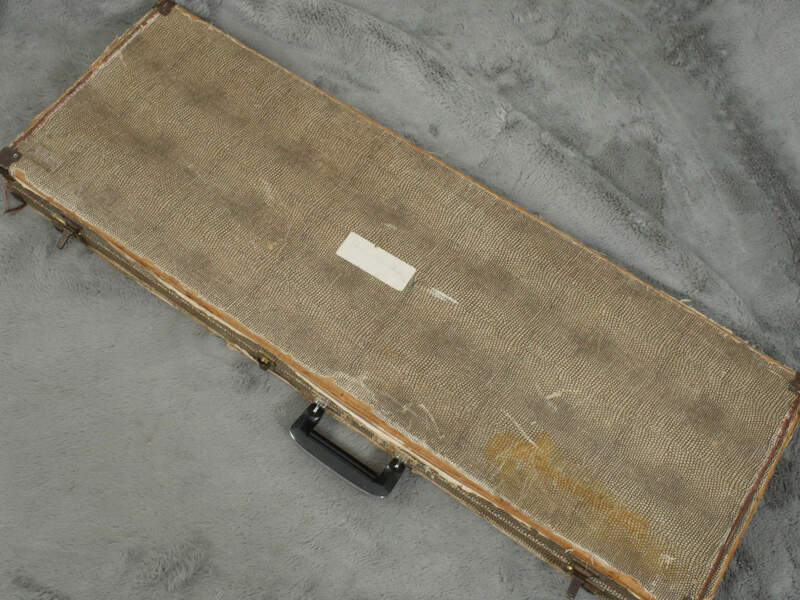 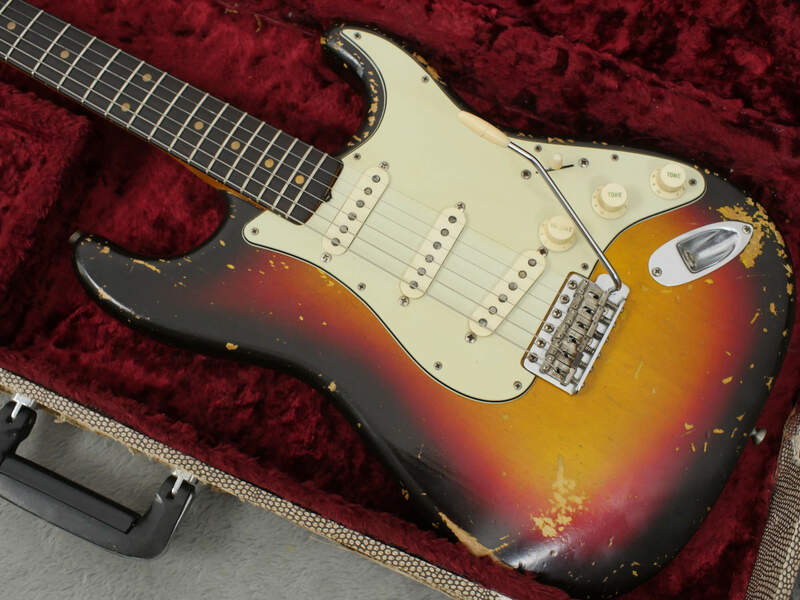 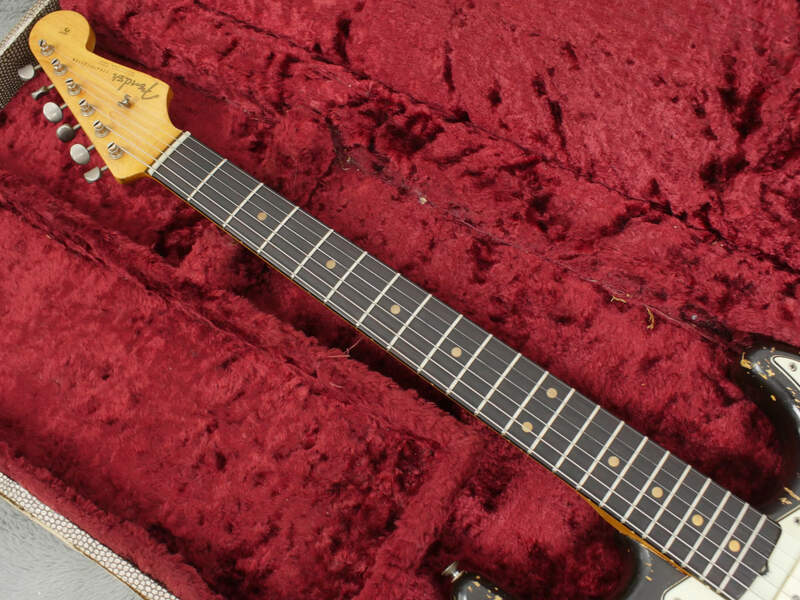 Included is the original Selmer case this guitar would have been supplied with from new.